It occurred to me the other day that I've never actually shared the products I use on an every day basis with you guys and considering I've been blogging for over four years now, I thought it was about time I got round to it. I personally love reading about other bloggers every day makeup routines and the products they use on a daily basis so hopefully you'll enjoy reading about my routine! I've included everything from primer to highlighter in this post so you can see exactly what I use when doing a full face of makeup. However, I don't always use primer and don't always bother with eyeshadow on a day to day basis but if I'm making a bit more effort, these are my go-to products. As I mentioned, I don't use primer every day as it isn't an essential in my eyes but I have been reaching for the Too Faced Hangover primer on a daily basis recently as it feels more like a moisturiser than a primer and I love how hydrated and glowy it makes my skin. I'm not sure it makes my makeup last any longer but it does prep my skin nicely for foundation and give my makeup a more flawless finish. Next up is foundation and my current favourite is the Giorgio Armani luminous silk. I bought this after a makeup artist used it on me and I loved the finish. It has a medium to full coverage and a beautiful, is really easy to blend and has a nice dewy finish that makes my skin look radiant, not greasy. After foundation, it's time for concealer. I'm quite lucky in the respect I don't suffer from bad skin so I tend to use concealer for highlighting purposes rather than covering blemishes. I've been using the Maybelline 'Eraser' concealer for around a year now and it's 100% the best high street concealer I've come across. I love the sponge applicator as it's so easy to apply to the areas I need it and the formula has a great coverage and blends beautifully. It also isn't cakey in the slightest, despite it's great coverage! The final step in my base routine is powder and whilst this isn't essential for everyone, if you have an oily t-zone like me, powder is a must have! I use a combo of the Kat Von D Shade & Light palette and the MAC mineralize skinfinish natural powder. I mainly use the yellow toned shade from the Kat Von D palette to brighten my under eyes and then the MAC powder to set the rest of my makeup. I can't recommend them both enough and together they give my makeup a lovely flawless finish. 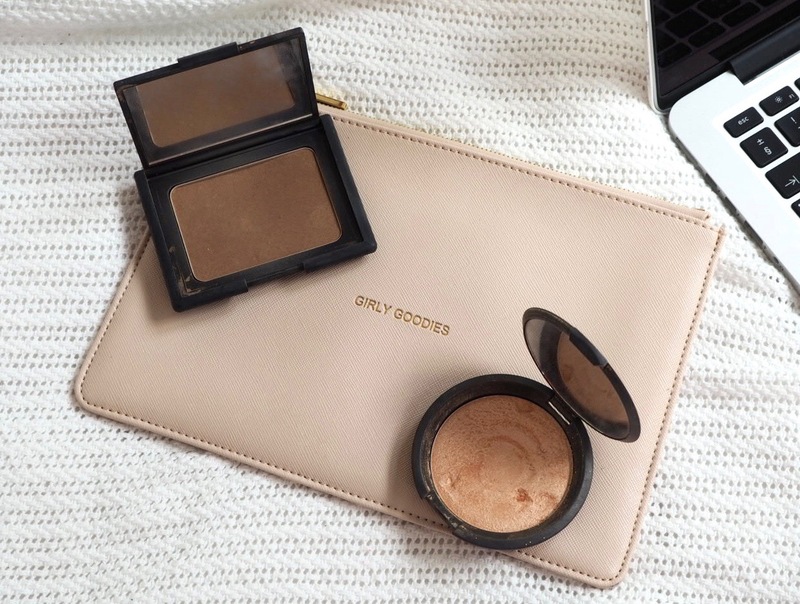 I'm not a big blush wearer so my only cheek essentials are bronzer and highlighter which I use every single day. My favourite bronzer is the NARS Laguna bronzer which I've been using for years now as it's the perfect shade for my skin tone - it's not too Orange toned so can be used to contour but it isn't completely matte so it also adds a lovely glow to the skin. In terms of highlight, I've been using the BECCA Jaclyn Hill 'Champagne Pop' Shimmering Skin Perfector virtually everyday since I bought it. It's the perfect champagne shade as she name would suggest and SO pigmented. I only need the lightest dab to create that perfect glowy complexion and I always get compliments whenever I wear it. Totally in love! 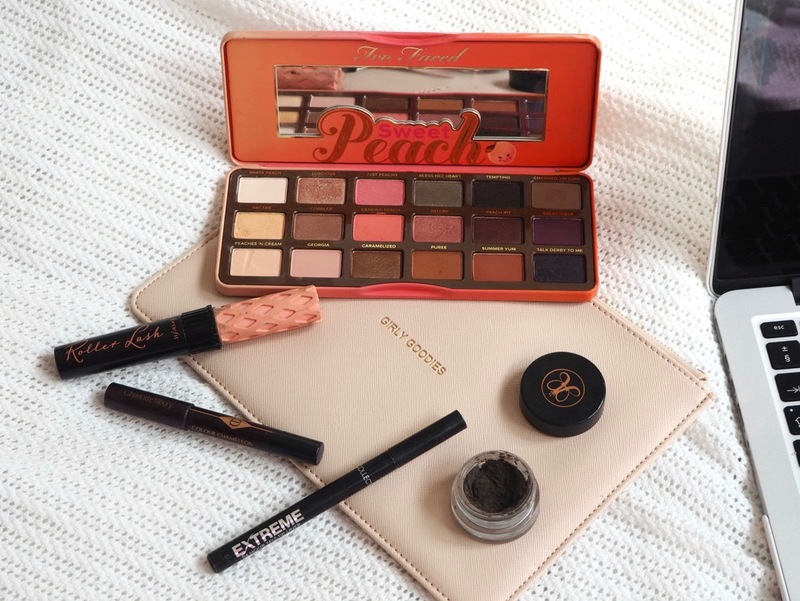 My go-to eyeshadow palette at the moment would have to be the Too Faced Sweet Peach palette. I think the shades are perfect for this time of year when I want to look bronzed and glowy and I love how pigmented and creamy they are too. My favourite combo would have to be Luscious all over the lid and Puree blended through the crease. I think these two shades work really well together and make for a really pretty day time look. In terms of eyeliner, I always wear both pencil and liquid. For me, my eyes feel naked without liner so these two products are must-haves in my daily makeup bag. I'm currently using the Charlotte Tilbury Colour Chameleon in the shade Black Diamonds and the Collection 24 hour felt tip liner which has been a favourite of mine for years now. No eye look is complete without mascara so I always curl my lashes and apply a couple of coats of Benefit's Roller Lash mascara. This is one of the best mascara's I've come across for giving my lashes curl, length and volume. I love it!! I have to be honest, the lip products I use on a daily basis can change quite regularly as I find lip products the best way to change up my look and because I have so many lip products, I'm always trying out new ones. 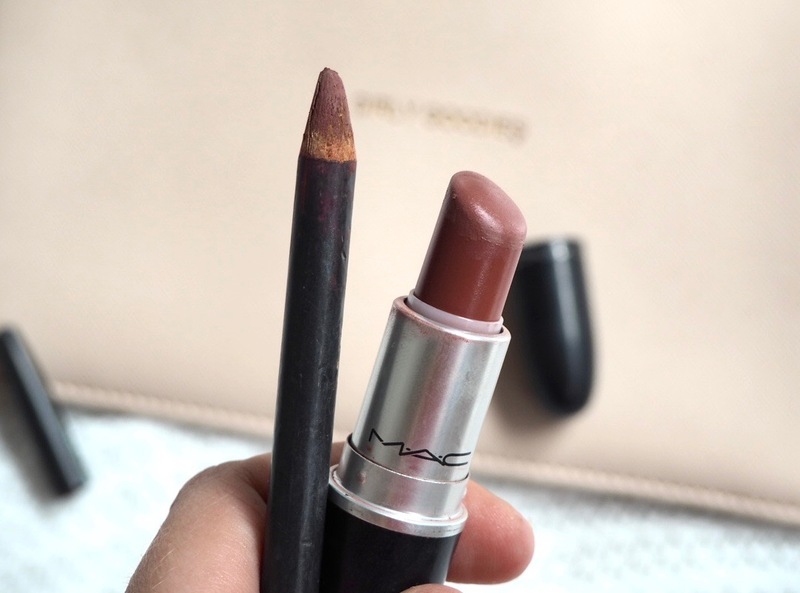 However, I do have a couple of products that I always turn to when I want a neutral every day lip and they're both from my favourite lipstick/liner brand, MAC. In my opinion, MAC can do no wrong when it comes to lip products and I have quite the collection of their lipsticks and liners. My favourite combo for an everyday look and the shades I tend to grab on a daily basis are 'Soar' lip liner and 'Twig' lipstick which are both dusky pink 'my lips but better' kinda shades. I love those kind of shades as they're so easy to wear and go with any makeup look. 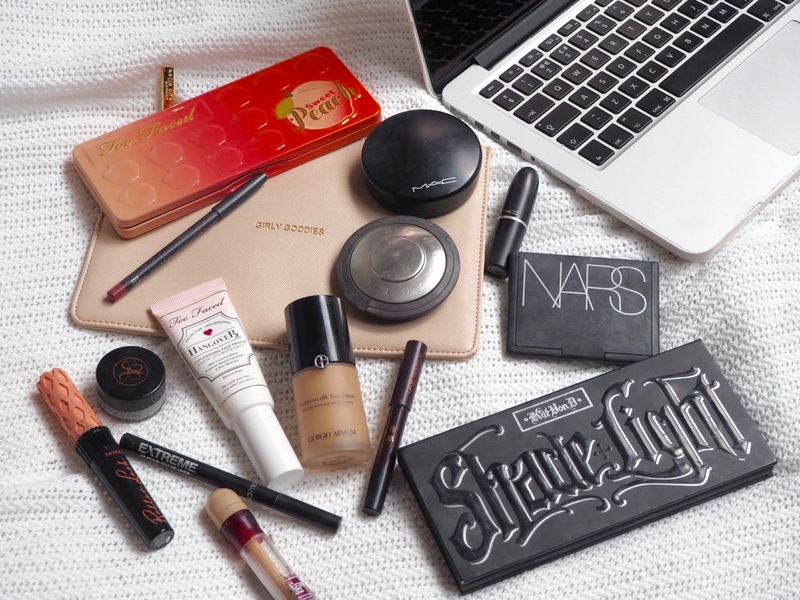 What's your every day makeup routine?! I think the Hangover primer is the absolute best! It feels great on the skin and looks so natural. Amazing products, love the dipbrow! Champagne pop is so well loved and I'm still without it! I love the look of soar, everytime I'm in a MAC shop I always gravitate towards it it's so pretty! I must try that Armani foundation. I find the Mac lipsticks so drying. Do you? For everyday I love the Charlotte Tilbury Matte Revolution lipstick in BOND GIRL. Love your blog! I really want to try the Kat Von D palette, it looks amazing! Love your blog! And this post. 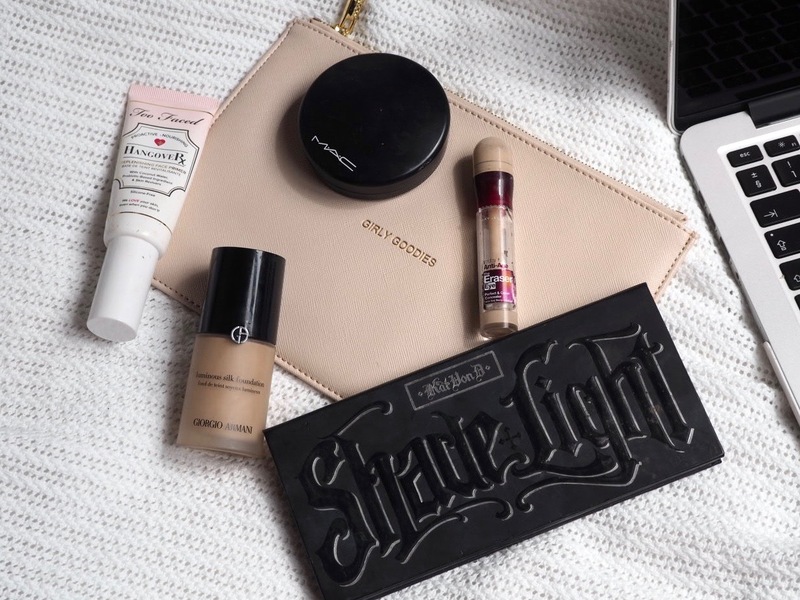 These are definitely great products, love the Shade and Light palette! I need to get Champagne Pop I've been after it for ages! Really wish I knew what I was doing when it comes to makeup haha, I just wack it all on!